Next the sky got clouded again, the forerunners of snow. 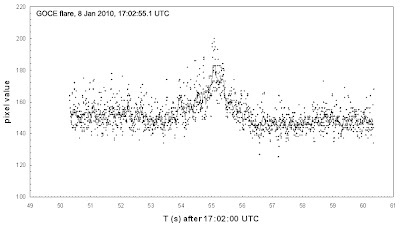 The GOCE flare behaviour is by now getting familiar (if still in aspects unexplained: see the previous post). 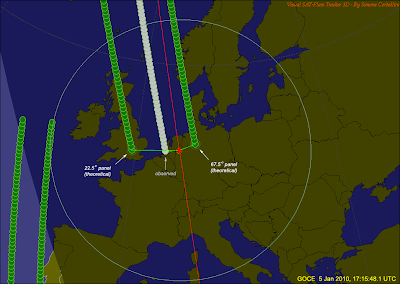 This time, the flare occurred at 17:02:55.1 UTC (Jan 8). This corresponds to an angle of 93.4 degrees and a tilt of 25.8 degrees. 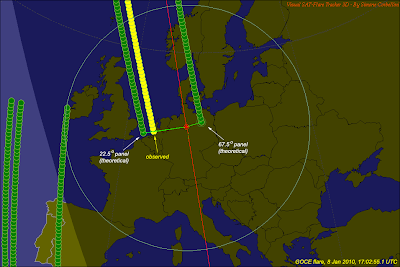 Below is the picture and the resulting brightness diagram. 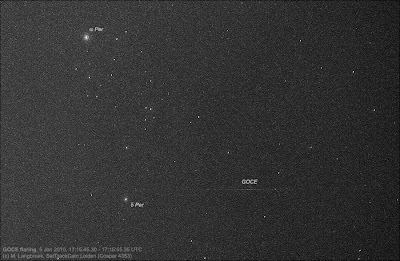 I also photographed a GOCE flare on 5 January, under appaling sky conditions. Start and end of the trail were not visible (hence, I cannot produce a brightnes sprofile for that flare) and in fact the flare even shos up only marginally (see image below). 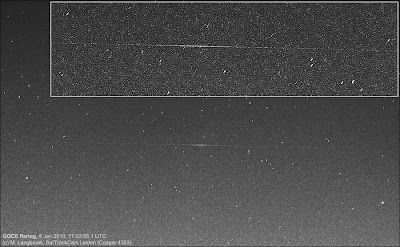 By measuring the brightest point of the flare and comparing to the GOCE orbit, it resulted in a flare time though: 17:15:48.1 UTC (Jan 5). This corresponds to an angle of 93.2 degrees and a tilt of 37.8 degrees.